music / Shows / Things to do / Things to do Around Town. 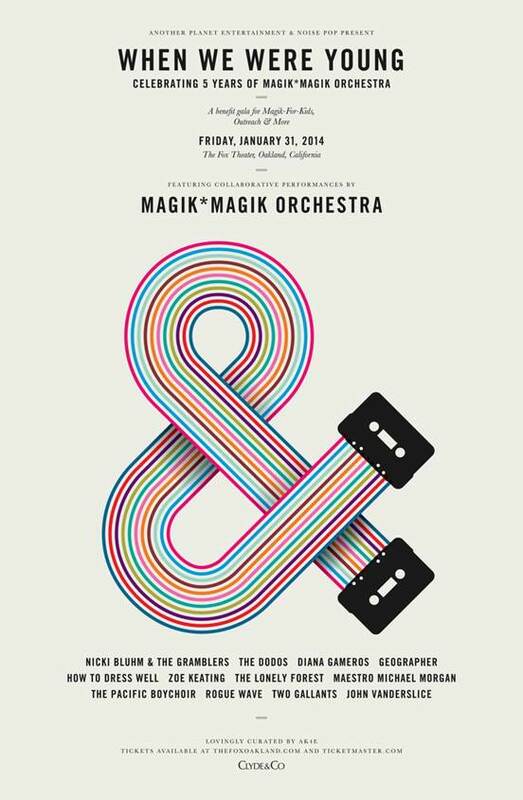 San Francisco-based Magik*Magik Orchestra, the leading independent, made-to-order orchestra for artists of all kinds, proudly presents “When We Were Young,” a special evening celebrating their 5th anniversary, at the Fox Theater in Oakland, CA on January 31st, 2014. The night, which is presented by Another Planet Entertainment and Noise Pop, will not only bring together some of the Bay Area’s most incredible talent, but also raise money in support of their new Magik For Kids initiative, which helps bring music lessons and experiences to kids throughout San Francisco. Tickets for “When We Were Young” range between $29.50-$45.00. There are also a limited number of VIP tickets available for $300. VIP tickets offer reserved seating, a private bar serving exclusive drinks, a separate VIP entrance to The Fox, access to the Telegraph Room, and private bathrooms. Tickets on sale this Friday, December 20th, at 12 PM PST – PRESS HERE to get your tickets. Magik*Magik, spearheaded by arranger/creative dynamo Minna Choi, has worked on over 100 projects, including performing and recording the original film score for Looper (starring Bruce Willis & Joseph Gordon-Levitt), composing arrangements for their 27-date tour alongside Death Cab For Cutie last year, and performing with Nick Cave and The Bad Seeds earlier this year at the Bill Graham Auditorium, among many other exciting projects. Whether it’s supporting How to Dress Well for a special set at the Pitchfork Music Festival or accompanying Zola Jesus for an incredible west coast run, Magik*Magik’s incredible arrangements and performances help artists take their songs to extraordinary heights. “When We Were Young” will consist of three 45-minute acts, during which several bands will join Magik*Magik Orchestra on stage for collaborative performances. Additionally, the critically-lauded 30-piece Pacific Boychoir will join a 30-piece Magik*Magik Orchestra for multiple songs, including “Cold Nites” by How To Dress Well and The Dodos’ “Ashley.” To honor the evening’s theme of “When We Were Young,” each act will perform songs near and dear to their hearts from their childhood. The majority of the evening will be conducted by Minna Choi with Maestro Michael Morgan, conductor of the Oakland Symphony, guest-conducting a few pieces. These artists are coming together to support Magik For Kids, a newly launched wing of Magik*Magik which aims to foster a love of music in children throughout the Bay Area with fun and innovative educational programs. Additionally, the evening will help fund Magik*Magik initiatives City Outreachand Commissions. PRESS HERE to learn more about Magik*Magik, and see how you can help the cause. Tags: Another Planet Entertainment, City Outreach, Death Cab For Cutie, Diana Gameros, Geographer, How To Dress Well, John Vanderslice, Maestro Michael Morgan, Magik*Magik, Magik*Magik Orchestra, Minna Choi, Nick Cave and The Bad Seeds, Nicki Bluhm & the Gramblers, Noise Pop, Oakland Symphony, Pitchfork Music Festival, Rogue Wave, The Dodos, The Lonely Forest, The Pacific Boychoir, Two Gallants, When We Were Young, Zoe Keating, Zola Jesus. Bookmark the permalink.